Classified Great Growth in 1953, Château Latour Martillac is named after its 12th century tower, built by Montesquieu’s forefathers. Latour Martillac caught the eye of Edouard Kressmann when he started his wine shipping business in 1871. A plot of vines called Grattecap, grafted in 1884, still includes the complete range of the white wine varieties that he suggested to the owner at the time. Alfred, Edouard’s oldest son, bought the estate in 1929. Taking after him, it was Jean Kressmann who had the boldness to design the present label in 1934, characterized by its oblique gold and sand stripes. Tristan and Loïc Kressmann, working with the finest consulting oenologists in Bordeaux, contributed a great deal to redesigning the cellars in 1989. 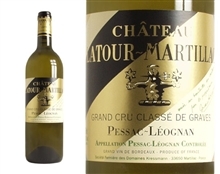 This in order to pursue the improvement, year after year, of this white and red Pessac-Léognan Classified Growth.